If robots had actually had a massive impact on jobs, it would certainly show in the employment statistics. As seen in the following figure it doesn’t, at least in the world’s 6 largest economies. While the curves of different countries are at different levels, they don’t show an increase over the past 30 years. Comparisons between the levels of unemployment among countries, however, are not as meaningful as they appear. The national statistics bureaus don’t define “unemployed” the same way. The maximum number of hours worked per month to be counted as unemployed are not the same, women’s participation in the work force varies, and the bureaus have varying levels of political independence. On the other hand, we can assume that, in any given country, they calculate these numbers the same way every year. As a result, we are better off comparing their variations over time. In the following figure, we pinch all the country curves to a common starting point in 1991. Then we plot the relative changes from that year on. 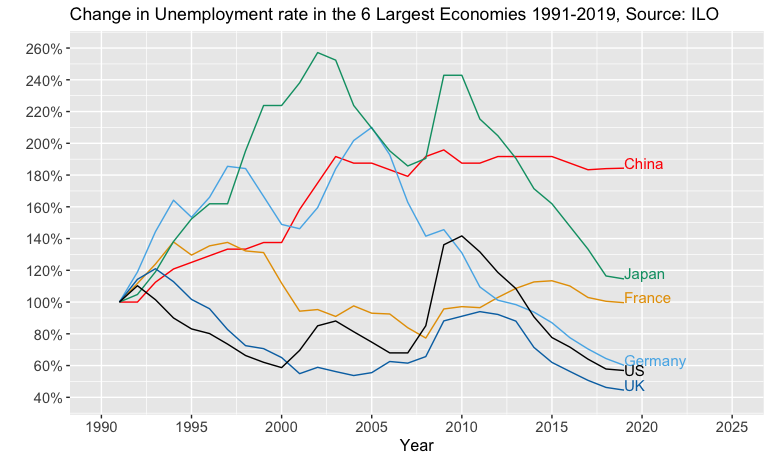 Japan’s unemployment is slightly higher in 2019 than in 1991, with wild swings in between, due to the long recession of the 1990s and the financial crisis in the late 2000s, not robots. 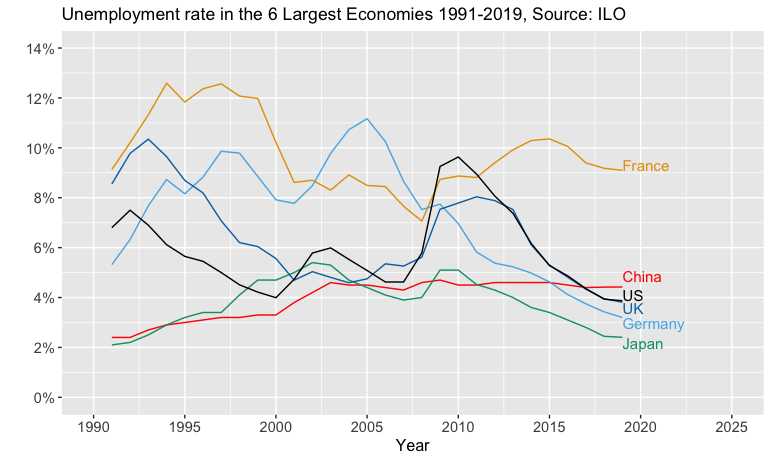 The other 4 countries all show lower unemployment in 2019 than in 1991. During these decades, manufacturers closed factories and laid off workers. This disrupted the lives of individuals and communities but mostly for causes unrelated to robots. All the above charts say is that society as a whole created more jobs than it destroyed. What we have been living through is an example of Schumpeter’s creative destruction, not a science fiction dystopia. Your job and my job may be threatened by robots but there is no evidence, even from the recent past, that they increase overall unemployment. This, however, does not prevent anyone predicting it yet again. Adding to the discussion about robots, I want to mention that robots replace repetitive or boring work and their introduction increases the job satisfaction. The issue is that the industry will have to care about reskilling and up-skilling the workforce to absorb the big shock of the change.